The impervious Rock of Gibraltar is situated at the southern tip of Spain, standing guard over the strait of Gibraltar which divides Europe and Africa. This strategic position has made Gibraltar the site of many battles over the centuries, yet despite this it has stood firm over the centuries resulting in the well-known English idiom 'as solid as the Rock of Gibraltar'. 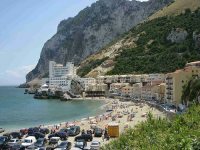 Gibraltar has its legendary beginnings in Greek mythology as one of the Pillars of Hercules, pushed away from Mount Acho in Morocco by the fabled strength of Hercules to mark the end of the Mediterranean and the comforting limits of the world as the ancient Greeks knew it. The Rock was ceded to England in 1713 at the conclusion of the Wars of the Spanish Succession (along with Minorca and much of what is now Canada), and remains a British Overseas Territory to this day despite many Spanish attempts to regain it, most famously during the Great Siege (1779-83). Gibraltar has been an irritant in Anglo-Spanish relations ever since. The upper parts of the sloping 1,400-foot (426m) rock have been made into a nature reserve to protect the Rock's natural environment and Gibraltar's most famous residents, the Barbary Apes. These sociable characters are the only wild primates in Europe and have lived on The Rock for hundreds of years, charming tourists with their delightful antics and curious natures. Legend has it that when the apes leave, Gibraltar will cease to be British. Today Gibraltar remains a popular holiday and business travel destination, and gateway to southern Spain. Gibraltar has an intriguing culture and fascinating history along with the bonus of a tax-free environment. This British Overseas Territory is full of surprises, from its unusual sand and limestone landscape, to its resident dolphins and a botanical garden to equal the finest in the world.